Protestant theologian turned apostate Judaizer Nicolas Antoine was burned at the stake in Calvinist Geneva on this date in 1623. Antoine (English Wikipedia entry | French) had followed a religious journey from the Catholicism of his birth, on to Protestantism as a young man. This arc in the first decades of the 17th century was potentially dangerous but scarcely uncommon. But Antoine took an incredible and taboo step beyond the schism in Christendom as his religious studies unfolded in Geneva and the short-lived independent Huguenot enclave the Principality of Sedan: he became steadily less convinced of the New Testament full stop, investing priority only in the Old. He became interested in Judaism. As a reformed pastor in the city of Metz on the French-German frontier, Antoine approached the local rabbinate to explore conversion. Fearing the reprisals such a scandal could draw, these worthies advised him to try Italy. Those Metz rabbis fancied the religious climate on the peninsula more accommodating, but they were mistaken: their brethren in both Venice and Padua spurned Antoine in the same way, and for the same reason. One of them suggested that he content himself to practice secretly, as a Crypto-Jew. This dangerous path he followed for some years. Become then a pastor in the village of Divonne — presently in France but Geneva-governed in his day — Antoine “secretly observed a thoroughly Jewish mode of life, saying his prayers in Hebrew and observing all the Mosaic rites,” according to the Jewish Encyclopedia, but his position on the pulpit eventually stretched past breaking his capacity to serve both conscience and vocation. A charge of heresy could no longer be avoided; the chief of the Geneva police arrested Antoine, and instituted proceedings. While he was in prison the clergy were tireless in seeking his reconversion, trying in vain to make him sign a declaration of orthodox faith. Bidden to formulate his religious belief, he drew up twelve articles, which were submitted to an ecclesiastical court. In them he gave the tenets of Judaism in the style of Maimonides‘ thirteen articles of faith, and added “eleven philosophical objections against the dogma of the Trinity.” At the same time he addressed to the judges three memorials, two of which have been preserved. In spite of the exertions of Metrezat, a pastor of Paris, and others, the judges were immovable. The trial commenced April 11; Antoine’s attitude, full of dignity, aroused much sympathy. The threats of the judges were of no more avail than the persuasions of his colleagues. He repeated constantly: “I am a Jew; and all I ask of God’s grace is to die for Judaism.” The court sought to show that he had promulgated his heretical doctrines at Geneva: this he contradicted most forcibly. All the efforts of the judges were met with the unchanging reply, “With the help of God I am determined to die in my present belief.” Fifteen clergymen or professors of theology were summoned as witnesses. Several of them begged for a light sentence, since, in their opinion, Antoine had committed no sin by becoming a Jew, though for his hypocrisy he deserved unfrocking or banishment, or, at the worst, excommunication. Furthermore, they said that the matter ought not to be hastened, and that the advice of the various churches and academies should be sought. A fanatical majority, however, insisted that the judges should seize the present opportunity to demonstrate their faith, since it was most dangerous to absolve one who had professed Judaism while wearing the garb of a Christian priest. For some days longer the judges waited for Antoine to recant. As his recantation was not forthcoming, they pronounced sentence April 20, 1632; condemning him to be loaded with chains, placed upon a pyre, to be there strangled, and then burned. In vain the clergy petitioned for a respite; Antoine was executed the same day. He went to his death serenely, and died imploring the mercy of the God of Abraham. On this date in 1431, an Essex priest named Thomas Bagley — “a valiant disciple and adherent of Wicliffe,” which is to say a Lollard heretic — was put to the torch at St. Paul’s Cross, London, while the Archbishop of Canterbury denounced his heresies. He was prey to a crackdown on his seditiously egalitarian sect launched in 1428 by the said archbishop, Henry Chicele. That outlawed movement still persisted despite the defeat of its most famous rebellion more than a decade before. Pressed by their persecutors, the Lollard movement mounted its last major armed rebellion weeks later, in May of 1431 — storming Abindgon Abbey and Salisbury Cathedral. The attacks came to nothing save the execution of its leadership. For many years thereafter, until its remnants swept into the Reformation, Lollardy haunted English elites from the shadows and the underground — “a persistent, covert tradition of radical thinking” whose reach in the English population is unknowable. It was never again strong enough to mount a rising in its own name but surfaced martyrs here and there and might have contributed inspiration and simpatico to other challenges that shook the masters in the 15th century, like (speculatively) 1450’s Jack Cade rebellion out of Lollard-rich Kent. On this date in 1591, the Dutch “witch” Marigje Arriens was burned at the stake. A 70-year-old Schoonhoven folk healer, Arriens (English Wikipedia entry | Dutch) was accused of enspelling some little twerp and driven into the whole copulating with Satan in exchange for supernatural powers thing common to many witch trials. A fairly well-known witch hunt victim, she’s the dedicatee of Swedish metal band Bathory‘s* “Born for Burning”. * The band’s name of course pays tribute to a whole other historic atrocity. Among the persons concerned in the Rye House plot was a man named James Burton. By his own confession he had been present when the design of assassination was discussed by his accomplices. When the conspiracy was detected, a reward was offered for his apprehension. He was saved from death by an ancient matron of the Baptist persuasion, named Elizabeth Gaunt. This woman, with the peculiar manners and phraseology which then distinguished her sect, had a large charity. Her life was passed in relieving the unhappy of all religious denominations, and she was well known as a constant visitor of the gaols. Her political and theological opinions, as well as her compassionate disposition, led her to do everything in her power for Burton. She procured a boat which took him to Gravesend, where he got on board of a ship bound for Amsterdam. At the moment of parting she put into his hand a sum of money which, for her means, was very large. Burton, after living some time in exile, returned to England with Monmouth, fought at Sedgemoor, fled to London, and took refuge in the house of John Fernley, a barber in Whitechapel. Fernley was very poor. He was besieged by creditors. He knew that a reward of a hundred pounds had been offered by the government for the apprehension of Burton. But the honest man was incapable of betraying one who, in extreme peril, had come under the shadow of his roof. Unhappily it was soon noised abroad that the anger of James was more strongly excited against those who harboured rebels than against the rebels themselves. He had publicly declared that of all forms of treason the hiding of traitors from his vengeance was the most unpardonable. Burton knew this. He delivered himself up to the government; and he gave information against Fernley and Elizabeth Gaunt. They were brought to trial. The villain whose life they had preserved had the heart and the forehead to appear as the principal witness against them. They were convicted. Fernley was sentenced to the gallows, Elizabeth Gaunt to the stake. Even after all the horrors of that year, many thought it impossible that these judgments should be carried into execution. But the King was without pity. Fernley was hanged. 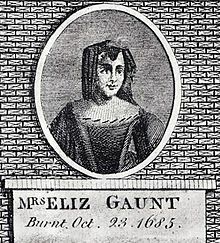 Elizabeth Gaunt was burned alive at Tyburn on the same day on which Cornish suffered death in Cheapside. She complained of the insolence of the judges, of the ferocity of the gaoler, and of the tyranny of him, the great one of all, to whose pleasure she and so many other victims had been sacrificed. In so far as they had injured herself, she forgave them: but, in that they were implacable enemies of that good cause which would yet revive and flourish, she left them to the judgment of the King of Kings. To the last she preserved a tranquil courage, which reminded the spectators of the most heroic deaths of which they had read in Fox. William Penn, for whom exhibitions which humane men generally avoid seem to have had a strong attraction, hastened from Cheapside, where he had seen Cornish hanged, to Tyburn, in order to see Elizabeth Gaunt burned. He afterwards related that, when she calmly disposed the straw about her in such a manner as to shorten her sufferings, all the bystanders burst into tears. It was much noticed that, while the foulest judicial murder which had disgraced even those times was perpetrating, a tempest burst forth, such as had not been known since that great hurricane which had raged round the deathbed of Oliver. The oppressed Puritans reckoned up, not without a gloomy satisfaction the houses which had been blown down, and the ships which had been cast away, and derived some consolation from thinking that heaven was bearing awful testimony against the iniquity which afflicted the earth. Since that terrible day no woman has suffered death in England for any political offence. Newgate, 22d of Octob. 1685. Mrs. Gaunt’s Speech, written the Day before her Sufferings. Not knowing whether I should be suffered or able, because of Weaknesses that are upon me through my hard and close Imprisonment, to speak at the Place of Execution; I writ these few Lines to signifie, That I am well reconciled to the Way of my God towards me, though it be in Ways I looked not for; and by Terrible Things, yet in Righteousness; having given me Life, he ought to have the disposing of it, when and how he pleases to call for it; and I desire to offer up my AH to him, it being but my reasonable Service; and also the first Terms that Jesus Christ offers, that he that will be his Disciple, must forsake all, and follow all; and therefore let none think hard, or be discouraged at what hath happened at me; for he doth nothing without Cause, in all he hath done to us, he being holy in all his Ways, and righteous in all his Works; and ’tis but my Lot in common with poor desolate Sion at this Day. Neither do I find in my Heart the least Regret for what I have done in the Service of my Lord and Master Jesus Christ, in succouring and securing any of his poor Sufferers, that have shewed Favour to his righteous Cause: Which Cause, though now it be fallen and trampled upon, as if it had not been anointed, yet it shall revive, and God will plead it at another Rate than ever he hath done yet, and reckon with all its Opposers and malicious Haters; and therefore let all that love and fear him, not omit the least Duty that comes to Hand, or lyes before them, knowing that now it hath need of them, and expects they shall serve him. And I desire to bless his holy Name, that he hath made me useful in my Generation to the Comfort and Relief of many Desolate Ones, and the Blessing of those that are ready to perish has come upon me, and being helpt to make the Heart of the Widow to sing. And I bless his holy Name, that in all this, together with what I was charged with, I can approve my Heart to him, that I have done His Will; tho’ it does cross Man’s Will, and the Scriptures that satisfie me are. Isaiah 16. 4, Hide the Outcasts, betray not him that wandereth. And Obad. 13 14, Thou shouldst not have.given up those of his that did escape in the Day of his Distress. But man says, You shall give them up, or you shall die for it. Now who to obey, judge ye. So that I have Cause to rejoyce and be exceeding glad, in that I suffer for Righteousness Sake, and that I am accounted worthy to suffer for Well-doing, and that God has accepted any Service from me, which has been done in Sincerity, tho’ mixed with manifold Infirmities, which he hath been pleased for Christ’s Sake to cover and forgive. And now as concerning my Fact, as it is called, alas it was but a little one, and might well become a Prince to forgive; but he that shews no Mercy, shall find none: And I may say of it in the Language of Jonathan, I did but taste a little Honey, and lo I must die for it. I did but relieve an unworthy, poor, distressed Family, and lo I must die for it. Well, I desire in the Lamb-like Gospel Spirit to forgive all that are concerned, and to say, Lord, lay it not to their Charge; but I fear he will not: Nay, I believe when he comes to make Inquisition for Blood, it will be found at the Door of the furious Judge; who, because I could not remember Things through my Dauntedness at Burton’s Wife’s and Daughter’s Vileness, and my Ignorance, took Advantage thereat, and would not hear me, when I had called to Mind that which I am sure would have invalidated their Evidence; tho’ he granted something of the same Nature to another, yet denied it to me. My Blood will also be found at the Door of the unrighteous Jury, who found me Guilty upon the single Oath of an Out-lawed Man; for there was none but his Oath about the Money, who is no legal Witness, though he be pardoned, his Out-lawry not being’ recalled; and also the Law requires two Witnesses in Point of Life: And then about my going with him to the Place mentioned, ’twas by his own Words, before he was Out-lawed, for ’twas two Months after his absconding; and tho’ in a Proclamation, yet not High Treason, as I have heard; so that I am clearly murdered by you.